Published on 29 November 2017 by Hidde de Vries in thoughts . There was a time when front-end developers would frown upon (former) print designers that designed for the web. At their usage of ‘perfect’ yet unrealistic content, and their creative ideas that were impossible to build with web tech. If this frowning since has scared print designers away from web design, I hope that they return in 2018. New CSS possibilities are ending the unrealistic content problem and the generic layout problem. It’s a great time to build layouts in CSS! It is now not as common, but I’ve still seen it happen in the past few years. A designer presents a design. The content lines up beautifully, because it is picked to fit perfectly. Headlines that only ever need one line, that sort of thing. It can result in beautiful and balanced visual design. But it doesn’t take many years of front-end experience to know that such designs risk breakage as soon as the template is hooked up to a CMS. The content is updated, and boom, it no longer fits. With new or real content, either the design loses some of its tidiness, or the CMS is set up to force character constraints on content. That leaves the design tidy, but the content inflexible. Most of these problems have to do with keeping things the same height and doing advanced alignment. These are both requirements that are super easy to do on paper and in design software. Easy to do when making a static comp. I guess. But CSS never had tools for doing this flexibly and with unknown content (table layout excepted). In the CSS Layout workshop I ran for Fronteers last week, I tried to emphasise that recent updates to CSS mean that the above is soon (or now, actually) no longer an issue. CSS Grid Layout (and flexbox, to some extent) will let us have our cake and eat it, too. We can make things line up or be the same height in a whim, regardless of content. We get flexible units like ch and fr that make it easier to line things up in a way that was always quite sensible, but never quite feasible. Unrealistic content, then, is less of a problem, as we have actual alignment options, rather than CSS trickery. Every so often, contracting for agencies, the designer of a new website would come to me and ask ‘What kind of layout framework are you using? What’s the grid, are we doing Bootstrap or Foundation?’ Sometimes the agency had already listed one of these as a requirement during recruitment. I often found that the in-house developers were used to dictating these kinds of things. Lucky bastards! The reason is probably practical: when producing website after website, it makes sense for a team to start optimising things and have one way of doing grids. When working with contractors, it is useful if that one way is a broadly used open source framework. But it also seems oddly out of order: it can be a lot like solving problems before you have them. The thing with CSS layout frameworks is that there is a fixed amount of stuff they can do. The things that are generic enough to make it into the framework. They speed up things, and are super helpful for prototyping and even creating production sites. But they don’t just create a generic way of working. They also create a generic look of websites. I’m not the first to conclude that. Web design with CSS frameworks in mind is, I think, to design defensively. The approach gives a lot of certainty about whether something can be built, which leads to happiness throughout the team, including product owners. 2018 may be the year that we no longer need to design defensively. Because Grid Layout is here. By ‘here’, I mean in our users’ browsers. In The Netherlands, on average 85% of users use browsers with full or partial (IE11) Grid Layout support. With CSS Grid Layout, we no longer need frameworks, CSS now is the framework. This is great, we can now solve problems when we have them. With something that is a web standard. There are new challenges, too. The stuff Grid (and flexbox, to some extent) does, can be unexpected to those who have not mastered the spec. That’s probably most of us. They have documented Grid’s behaviour exceptionally well there, but it is perhaps only in real life designs that we will get a feeling of how it all works. For instance, what autoplacement does and how to leverage features like minmax and min-content to get our designs exactly how we want them. Grid Layout has a lot of ‘leave it to the browser’ kinds of settings. Rather than ‘make this thing 400px wide’, you set things like ‘make it fit roughly between 40 and 60 characters’. More than ever, it is clear that CSS isn’t about exactly specifying what we want. It is the nature of the web to be flexible, and it should be our role as designers and developers to embrace this flexibility, and produce pages which, by being flexible, are accessible to all. The journey begins by letting go of control, and becoming flexible. “Letting go of control” is about letting the browser decide based on our hints. Browsers are good at this. They have all the knowledge: what device they’re running on, how much space is available, what fonts are available, which settings the user has set, et cetera. But it isn’t necessarily something all web teams like to do, I found. Even if we as CSS developers have mastered the spec, we still need to be able to communicate and explain the consequences of our code to designers, product owners and stakeholders. This is key. It requires us to explain stuff to the rest of our team. Results that struck us as unexpected will likely strike them even more. Historically, we’ve seen a lot of website owners like the idea of their websites looking exactly the same everywhere. But it is now clear to most that this is no longer feasible. The case for flexibility has become lots stronger in our current multi-device reality. The internet is on so many devices: fridges, cars and watches with browsers now exist. This reality has powered the responsive design argument, and think it can power the flexible layout argument, too. So, yes, the web is ready for great graphic design. The flexibility it was invented with has recently flourished with the surge of responsive web design. We now have CSS layout methods that let us embrace flexibility and they have good browser support. Cool experiments are done with CSS Grid Layout. The case for using flexible layout methods will require clear communication between front-end developers and the rest of the team, as well as in-depth knowledge of these new lay-out tools. But I think we can do this. We’ve done it before with responsive web design, and we can do it again! Björn Seibert replied: “The web is ready for great graphic design” Yes! But anyhow don’t let the print designer do the web job - again. Bram Willemse replied: Zoals verwacht, in oefening 1 krijgen we een citaat van Erasmus voor de kiezen. Volgens mij zit ik bij een workshop van @hdv! 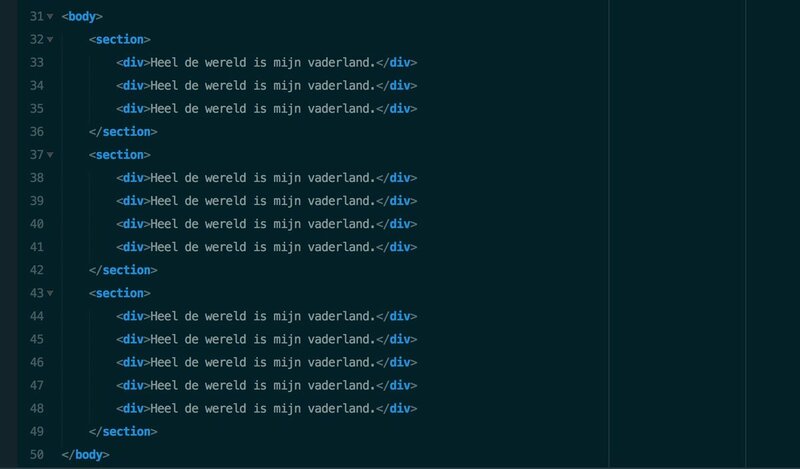 Kaj Rietberg replied: The web is ready for great graphic design hiddedevries.nl/en/blog/2017-1…. Great article by @hdv. Jonas Kuske replied: "The web is ready for great graphic design"
How web design is about "letting go of control", only describing the desired appearance and letting the browser handle the exact design. CSS-Tricks replied: Former print designers who were scared away from web design because your interesting layouts were nixed... come back! Lauren Hutchison replied: Real_CSS_Tricks: Former print designers who were scared away from web design because your interesting layouts were nixed... come back! Aleš Krejčí replied: "Grid Layout has a lot of 'leave it to the browser' kinds of settings. Rather than 'make this thing 400px wide', you set things like 'make it fit roughly between 40 and 60 characters'."